WIP Wednesday: I'm still here! So where exactly did the last two weeks go? Between a big presentation for school and a whirlwind trip to Georgia for a college friend's wedding, I got pretty close to zero sewing done. I did finally finish the hand quilting on Park Ranger Fiance's Civil War quilt! And I'm halfway done with sewing the binding on! I decided to go with bias binding for this queen sized monstrosity so I got that all made up last night before I went to bed. Of course I didn't have enough fabric to make continuous bias binding from just one square, so I made two squares as big as I could and made two sections of bias binding that I sewed together. In looking at how much is left after I sewed the second corner, I might be cutting it REALLY close. Yikes. I have a little bit of this fabric left, but not enough to really make more bias out of, so prayers for not running out of binding on this one would be appreciated. I'm going to apologize at the onset for the lack of pictures. I have another baby quilt to make for a friend from church whose baby shower is in June. 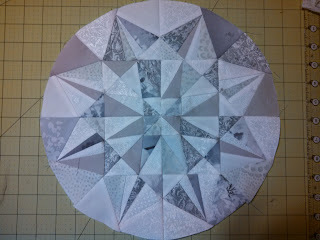 I decided to use this pattern from Moda Bake Shop by Amy Smart of Diary of a Quilter. 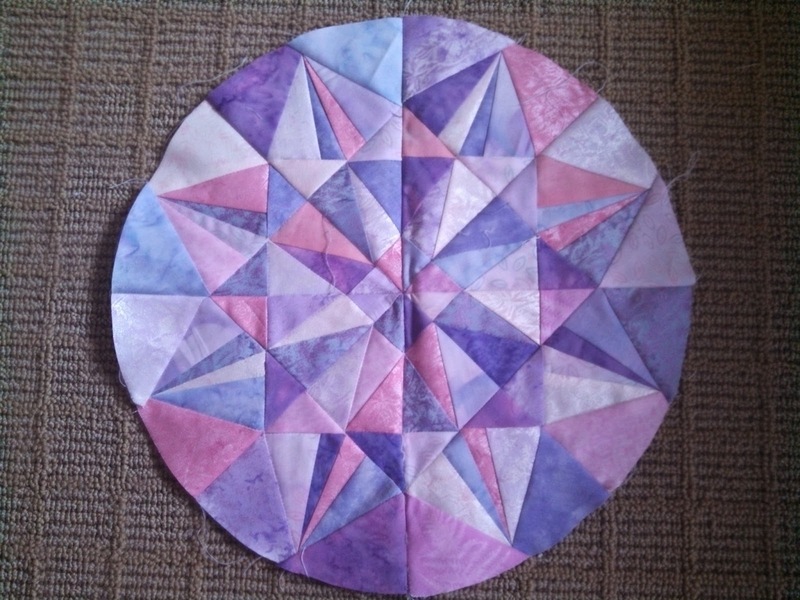 It is an older project, but it is perfect for the gender neutral quilt that I need to make. I ended up using colors almost identical to the original pattern! And here is the whole top put together! And every stitch of this fabric is from my stash! Woot! Now to get a batting and quilt this little thing. I've finally finished my June birthstone block and put together my April diamond birthstone block! You can find the pattern from No Hats in the House here. 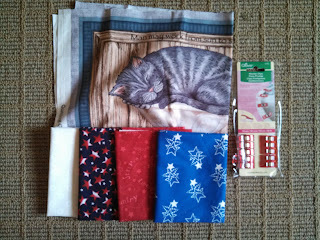 And I've already won one giveaway from the Sew Mama Sew Giveaway Day from Cat Patches! Wooo! Yesterday I got my goodies from the May Fat Quarter Friends Swap! And yes, that is a package of Wonder Clips! I am very excited about that. 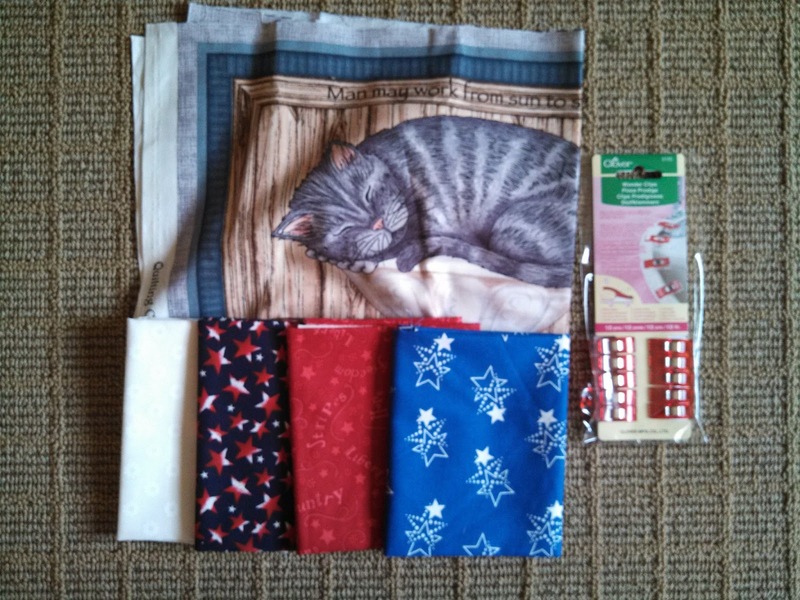 I requested red, white, and blue this month because I am planning to make a patriotic wall hanging using the Uncle Sam pattern from Quiltmaker. It is a rather old pattern, but I happen to have an actual copy of the issue that it is featured in! Hooray! I'm planning to use red/white and blue/white prints instead of the "natural" used in this pattern to make mine a little less country/rustic looking and a lot more POW BAM I LOVE AMERICA looking. If that's a thing. Happy Friday to you, no finishes for me this week, but hopefully next week! 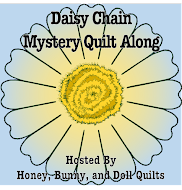 This month in Hive 4 of the infamous Stash Bee, our Hive Mama is Candace from Saltwater Quilts! I love Candace and her blog and am so glad that she's all moved so she'll hopefully have some new projects to show! She chose a modified version of Red Pepper Quilts' log cabin pattern in fun bright colors. I came up with a paper pieced pattern for it but didn't think ahead of time that it is an 11.5" finished block--bigger than a piece of paper! Oops. So I taped two patterns together and just went at it. I made six blocks, because I have a lot of scrappy stash. I keep racking my brain for what pattern I would want to do for my month in November. Glad I still have a while to decide! 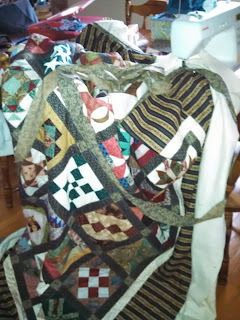 This month, I am really going to finish Park Ranger Fiance's Civil War quilt. I have almost all of the hand quilting of the blocks done and then just have to do the outer border in some simple fashion. I. Will. Get. It. Done. 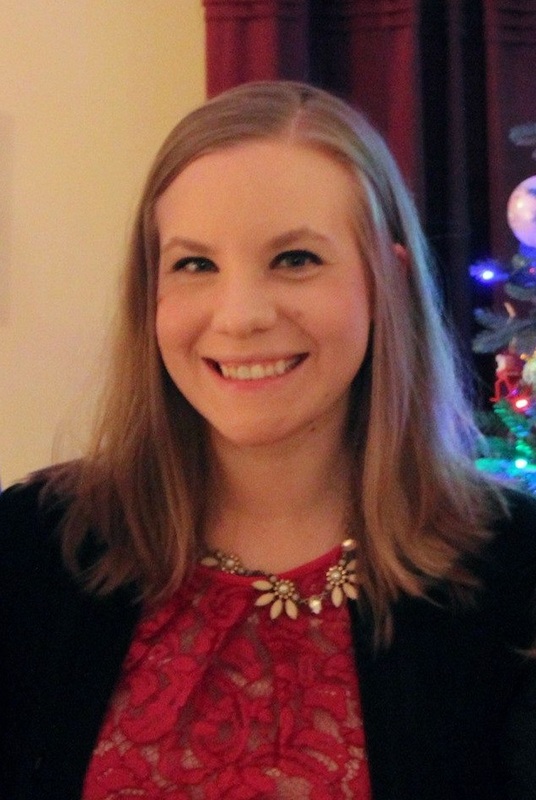 Linking up with A Lovely Year of Finishes! I started and am more than halfway done with my third birthstone block! 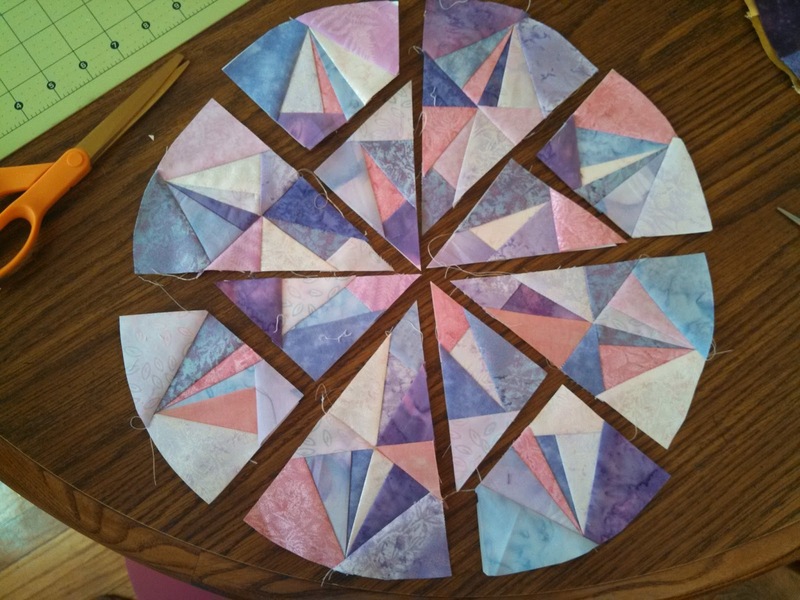 I finished up the paper piecing last night and now need to sew the last four wedge halves together and then sew all of the wedges to each other. You can find the pattern from No Hats in the House. This project just proves that Fairy Frost is one of the greatest things ever. Sharing at WIP Wednesday at Freshly Pieced!